Welcome to my 2nd tour of yet another wonderful garden! 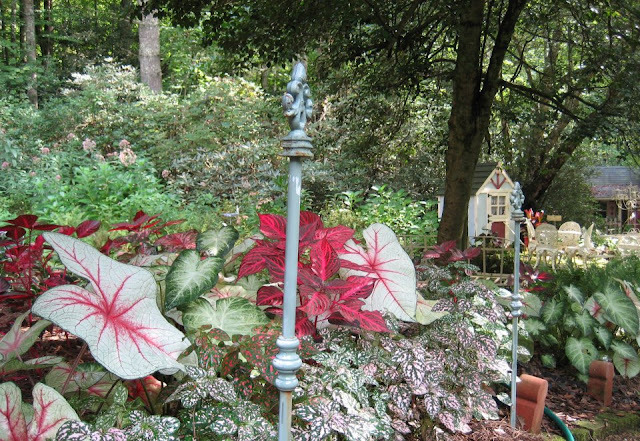 Barbara's gardens are located near Hendersonville in the Blue Ridge Mountains of North Carolina. She's a very creative person! She calls this her Bee Shed where she stores her bee yard equipment...She's created a theme around Winnie the Pooh- hence the bell and"Mr. Sanders" sign over the door! Notice the chair that has been "potted"! These are her beehives that have to be protected by an electric fence because of the bears! Yes the bears!! These are a "rustled rambler" Rose. She was able to get some starters from a group of very old roses nearby that a neighbor had planted long before she was born. What a great shot...so storybook like! reclaimed metal basket planted with flowers! Her touch of whimsy shows up in many places! 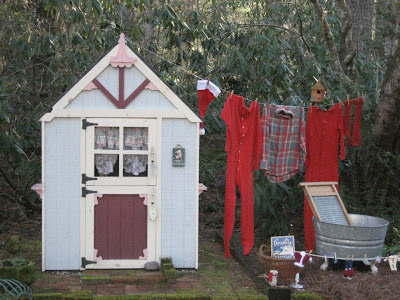 Her creative use of re-purposed items is inspiring! See the adorable thimble and the old silver spoon! Her Endless Summer Hydrangeas looking marvelous! She has the highly acidic soil that gives her the advantage of that wonderful blue coloring so desired in the hydrangeas! 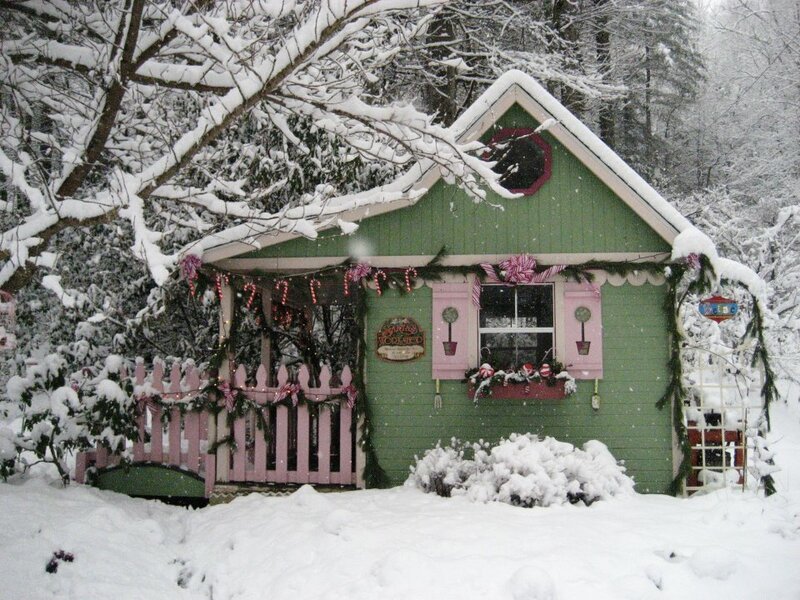 This little cottage is the cutest thing! Notice all the details with the scalloped edge, shutters, fencing and the trellis! Lets take a peek inside! Notice too the hand painted floor! She has the Queen Elizabeth Grandiflora rose like I do! Looks like some Little Princess Spirea too! Crickhollow also serves as Santa's workshop at Christmas time! This was a couple of winter's ago when they actually got snow! 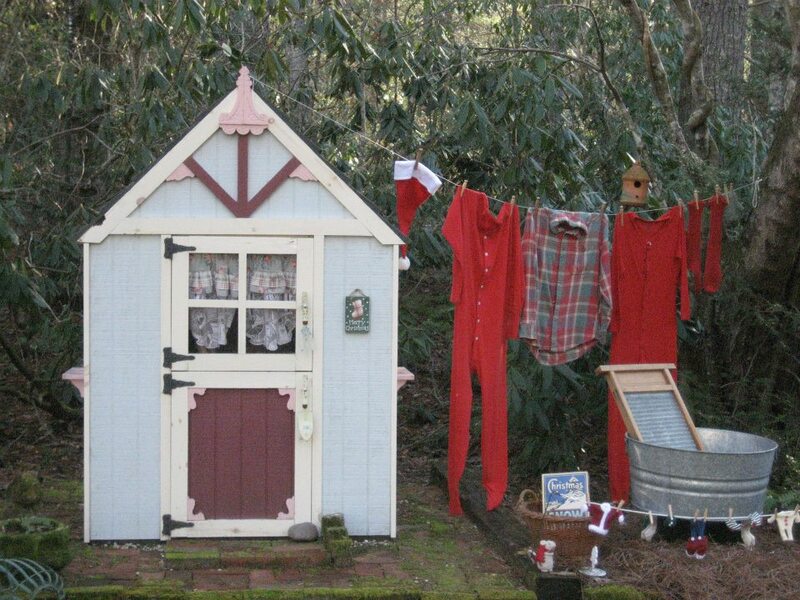 Santa's clothes needed freshening up too! 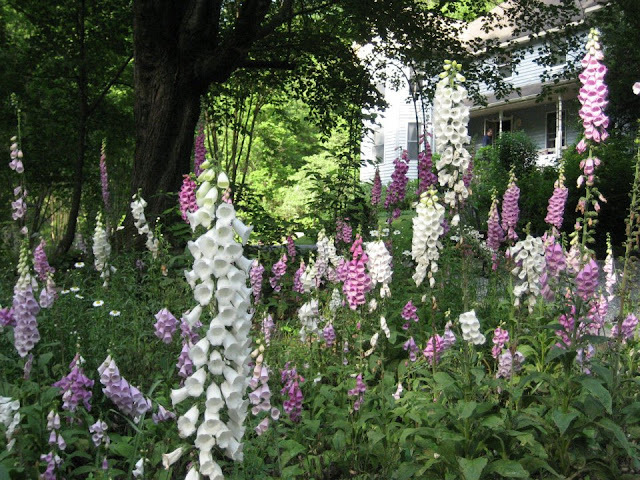 One of my favorite shots...Foxgloves are truly an enchanting plant! Have you ever watched a bee go up inside one of their flowers! Love it! What a pretty walkway by the house! to develop, but that's part of the fun! Isn't this a fun place! I hope you enjoyed this peek into Barbara's gardens! It's fun to see some of the creative things people can do with their yards. 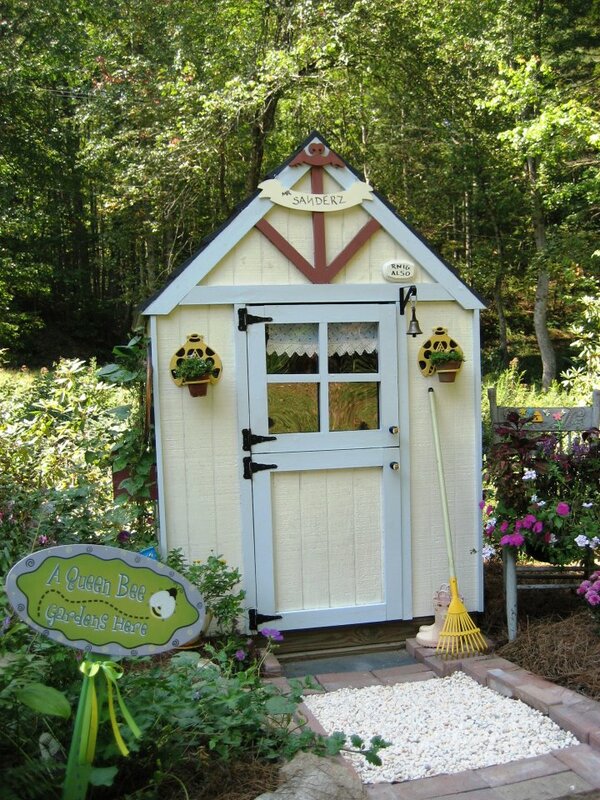 Just painting a tool shed can bring new life to your yard! I have a shed I'd love to adopt to put my garden bench and supplies in like hers! I've even seen some with a little chandelier in them that I thought were adorable! 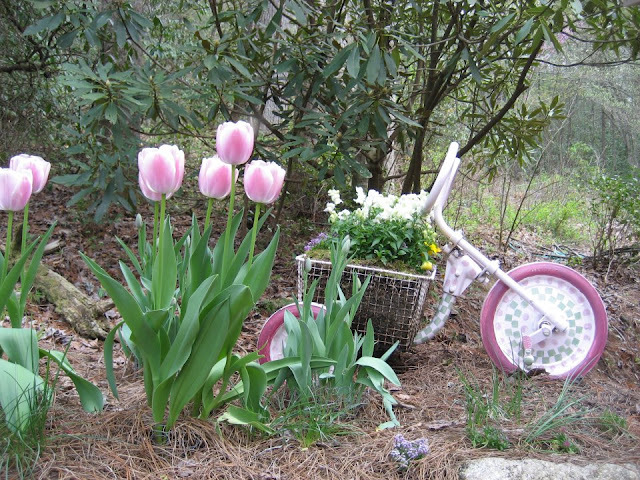 We all have a little nook we can create in...even if it's only a flower pot one can turn it into a bit of fun with some whimsy! I've seen some adorable fairy gardens in very tiny places! I love hearing your comments and I'm sure Barbara will too! Wow!!! Another affirmation of how creative Barbara is. I only wish the inside of my shed was half as neat as hers and the flowers are just stunning. I think her crib fairy garden has always been my favorite though. You must have been in heaven the last week or so in your gardens with as nice as our weather has been Barbara!!! Love love love your gardens. Thanks, Tess! 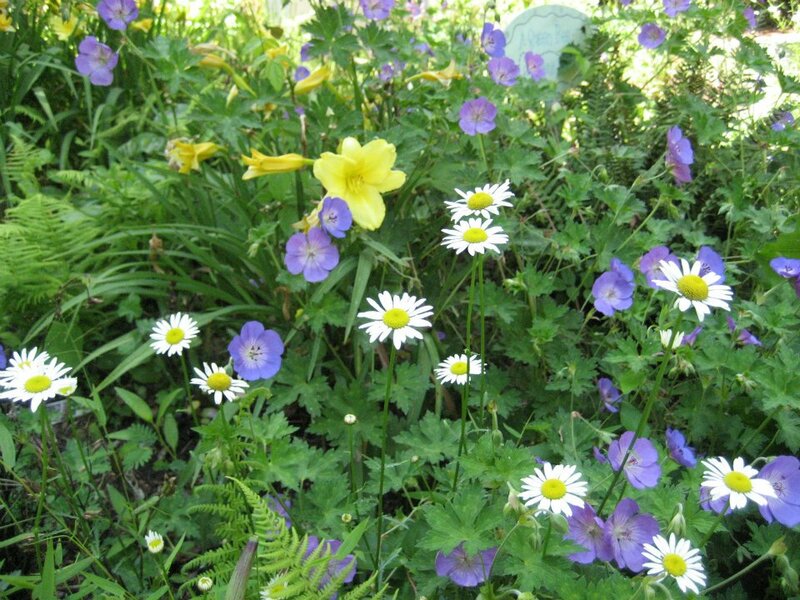 Following after your gorgeous gardens is quite a compliment and a high benchmark to aim for. The weather has been great and I have been out taking advantage of it for sure. The heat is about to put a halt to some of my more strenuous endeavors for a few days, though. I love a whimsical touch to gardens and your friend Barbara has created a special place with her sheds and colourful blooms. Thanks for the tour. What a wonderful place to get lost in all that garden wonderfulness!!! Barbara's Bee House and Potting Shed are totally to die for ... my mouth is hanging open in amazement as I type this. Thank you for sharing this with us. Dear Liz, I'm so grateful for your sweet compliment of including my garden in your blog. Thanks to your readers as well for the kind comments. You're making me blush :o) We live off the "beaten path" as you might see from the last pic, and don't get many visitors, so I love sharing our place through pictures. I also have to give a lot of credit to my sweet and brilliant hubby, who helps me bring my vision to life with the little cottages and other structures. I tell everyone that he's the brains and I'm the brawn of the team. Barbara, I forgot to give mention about your hubby- I know he's an important part of a lot of your projects! Beautiful garden to take in. so many lovely places and the pink cottage is adorable. It's difficult to choose a favorite. The fairy garden is so darn cute. Thanks for sharing yet another lovely garden. What a wonderfully, enchanting space! Barbara is so wonderfully creative! I love how she changes the look with the seasons and holidays. How fun! Thanks so much for sharing! The garden is gorgeous! Almost like a fairy tale. . .
Wow! What a totally charming and lovely environment! I can appreciate the work and the expense that goes into such an endeavor. She could probably sell tickets! Well, I really enjoyed this wonderful tour. What a pretty yard. Just my style. Cute, cute, cute. I am pretty much speechless on this one! Goodness gracious, there are SO MANY cool details all around! Of course, the flowers are exquisite! The grounds look almost liek a movie set!!! 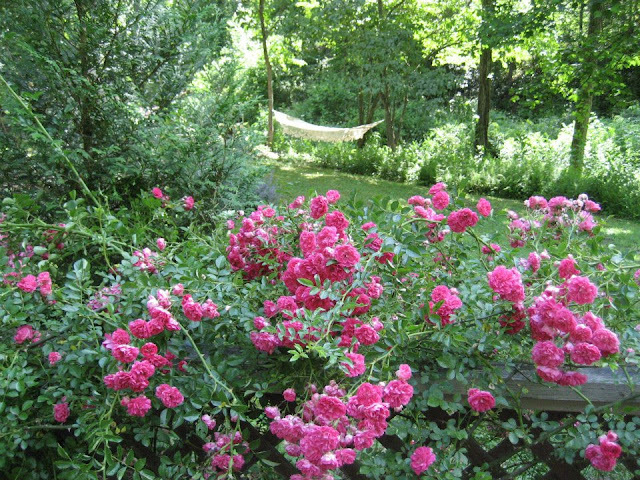 I do not have that green thumb like so many do, and I am always happy to see beautiful gardens and dream! 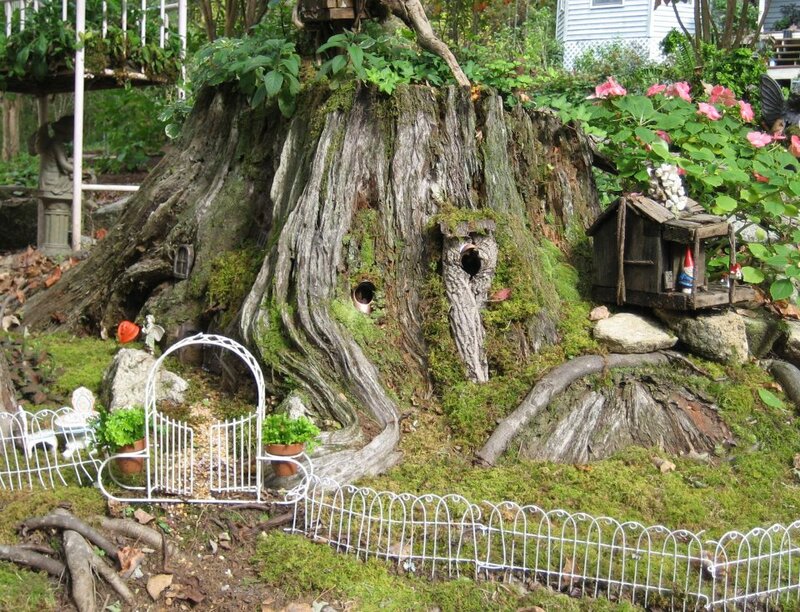 Barbara is VERY imaginative, and I think that fairyland tree stump is just the most creative thing ever!!! We have a tree named Big Bertha in our yard with a body just about that size. Poor Bertha is, however, breathing her last breaths and will probably have to be put to sleep in the next couple of years. What Barbara has done with this stump gives me wonderful ideas on how to preserve Bertha's memore and still not get in trouble with our very picky HOA! :-) Barbara is VERY brave to have those bear magnets out there! :-) I'd be freaked out if I saw a bear (Winnie the Pooh excepted!) in my yard!!! So cool, though, to keep bees! I LOVE the Garden Lady!!! 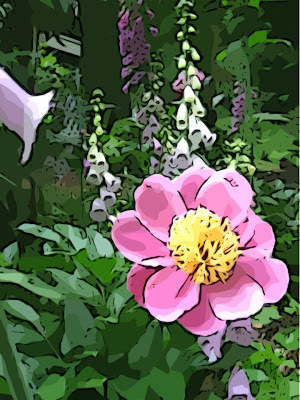 I'm going to forward this link to my friend, Sheri, who just loves flowers and fairies and whimsical stuff. She'll enjoy this even more that me...if that's possible!!! Wow, such a beautiful garden and each images of your flowers and the darling cottage is just gorgeous. Love the fairy too. What a lovely garden you have featured here. I particularly like the shed. It is so sweet. And I like the fairy garden as well. Goodness what a lovely garden and a kindred spirit as I am a beekeeper also! A friend emailed me this link knowing I would love it and she was right!! Please thank Barbara for letting you show off her lovely gardens! does she have a blog? I am following you now also to see more loveliness! Thank-you for coming by! I will let Barbara know. No she doesn't have a blog but I think she could offer a lot if she did! Mary Ellen, I'm happy to meet a fellow beekeeper and gardener. I've been keeping bees about 5 years and still feel like a newbee. They're great for the garden, fascinating to learn about, and the honey's nice too! I appreciate your comments, and I've thought about starting a blog....but decided I didn't have time to do that and everything else I enjoy doing. Maybe someday! That's great Sheri! Thanks for stopping by and I'm so glad you liked it! Sheri, I'm so happy that you enjoyed the tour. I do have fun with the garden whimsy. It keeps me young! I keep trying to get myself to relax and "drift away" on my hammock, but I always see weeds that need pulling or think of a million other things I need to do. Wow...Saying "thanks" for all of your sweet remarks doesn't begin to convey how much I appreciate ya'll! After some recent gardening challenges that have left me saying "Why do I even bother? ", your enthusiasm has re-energized me to face the voracious voles, rapscallion raccoons, bad bugs and wily weeds. I wish I could share with all of you the beauty I enjoyed tonight of fireflies flickering in the dusk and the smell of the honeysuckle and fresh-cut grass. I do love opening the garden to others, even if only through pictures. Thanks for strolling through with me and thanks especially to Liz for introducing me to you all. Inspiration and smiles abound here! Love every nook and cranny. What a magical place! Thanks for sharing the beautiful pictures. Thank you, thank you for the wonderful garden tour of your friend! I've spent quite a bit of time looking at all the pictures. 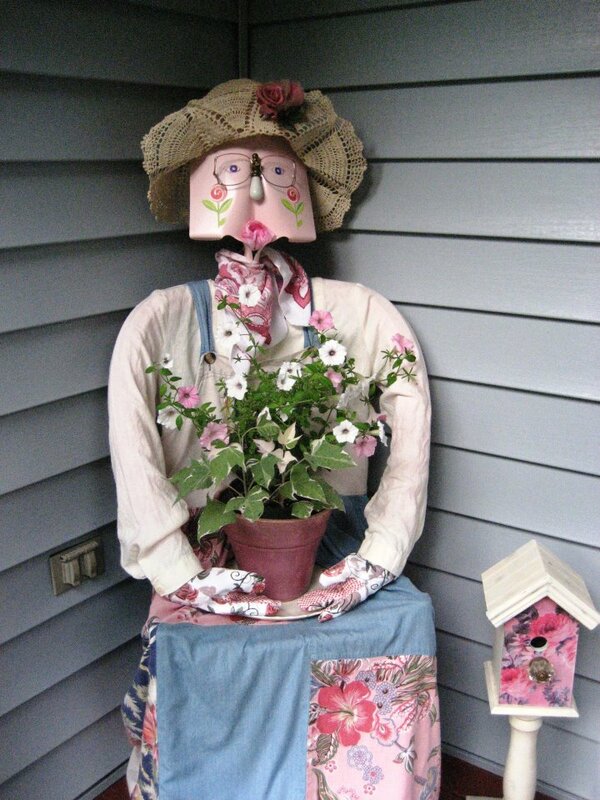 I love her gardening lady. I'd like to try making one for myself! 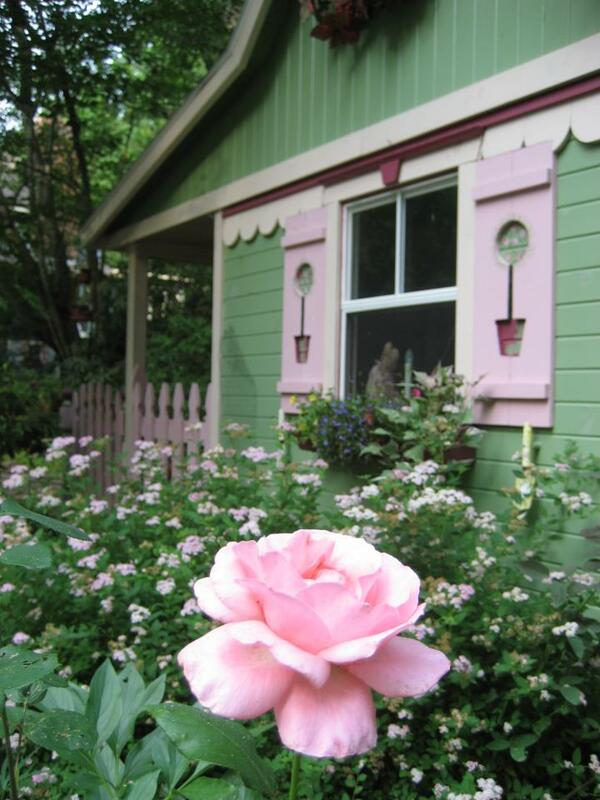 Darling tiny shed and gorgeous flowers. Happy weekend to you. What an absolutely charming garden. There is so much to see, and all of it perfectly beautiful--thank you so much for sharing it with us, and have a wonderful weekend! Magical. 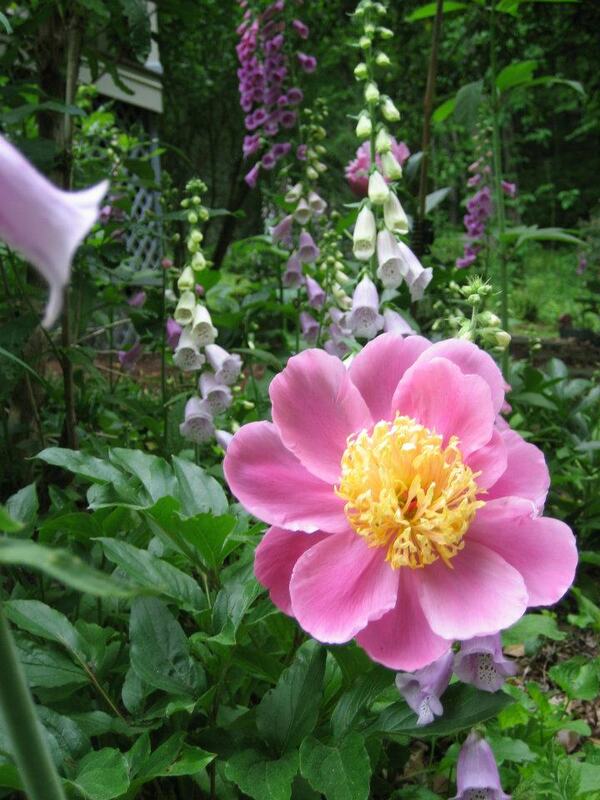 The flowers do look like something you would see illustrated in a book -- beauty beyond words. And the little cottages are so sweet. How lucky for Santa to have such an inspiring location for his workshop. I am the younger following. I found from the wonderful PARTY Fishtail Cottage ... I think you are in paradise. Hard work great results !!!! 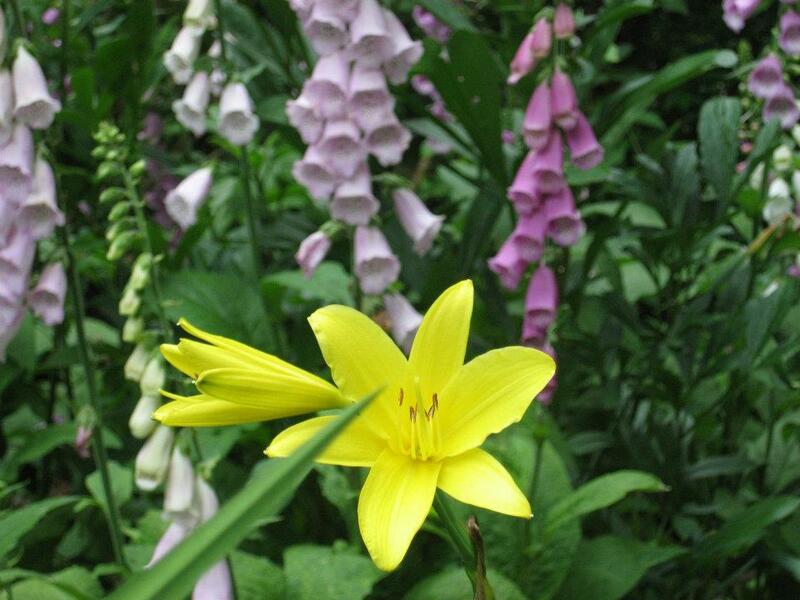 Thanks so much for sharing this magnificent Garden with us!! It is a sheer delight! Full of so much eye candy and inspiration! 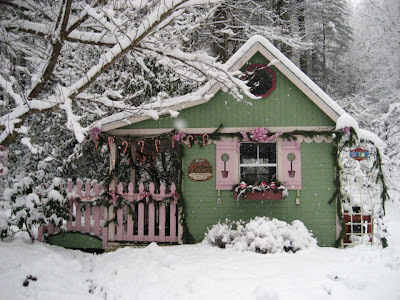 I am totally in love with the sweet cottage with the CrickHollow Cottage being my very favorite!! Those are the colors of my Craft and Sewing Room! And the pic of it at Christmas is spectacular!! PLEASE tell Barb that she is a true Garden Artist!! I would absolutely see her gardens in person but this is definitely the next best thing!! Thanks so much for sharing! I loved it! Should I wipe the drool off my face now? lol! Seriously, this is my kind of garden. 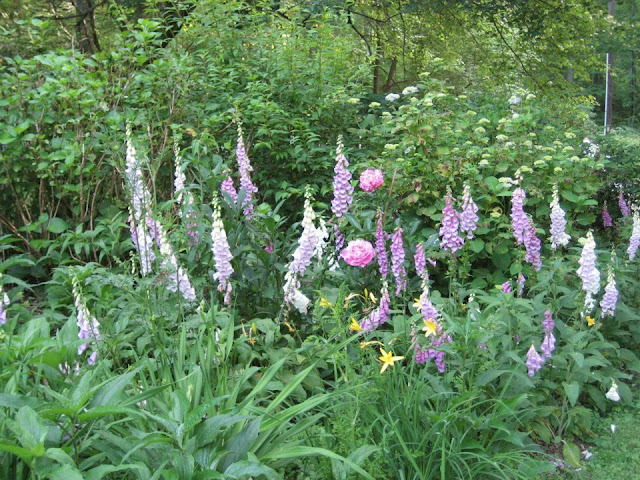 Cottage gardening is my favorite style. I love when flowers mingle together. Foxgloves are one of my favorites and hers are gorgeous. Love, love her out buildings and fairy gardens. The one under the large tree stump was just fabulous! So happy to meet Barbara. She is one terrific gardener. Thanks for sharing this with Share Your Cup. What a fun and beautiful garden! OH my goodness! I am just enjoying these pictures sooo much! Gorgeous, pretty and beautiful! I'm your newest follower! 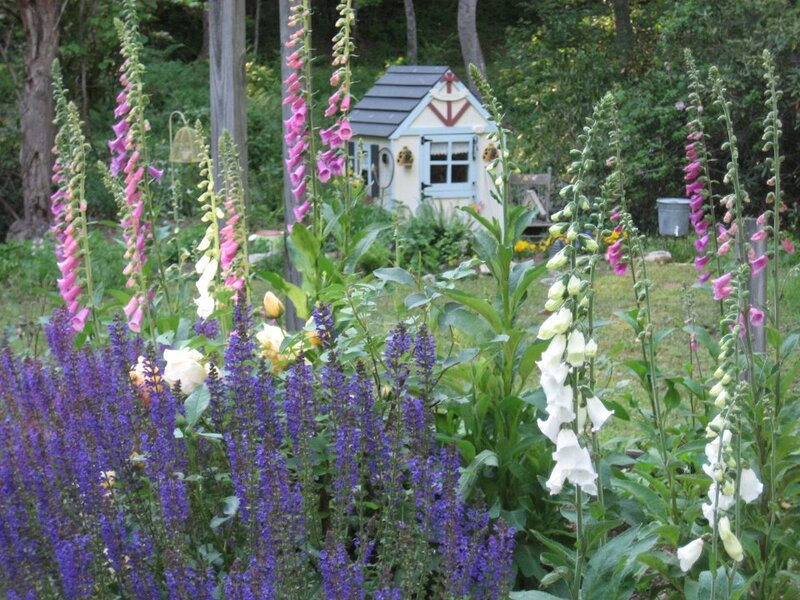 Thanks for sharing this amazing garden and those garden sheds are awesome! WOW!! What a wonderful place. Thanks for the tour. The garden is so beautiful!! I appreciate every one of you and your sweet comments. I hope that you all have a happy place that gives you as much joy as my garden and our mountain "hollow" does for me. Un monde enchanté dans lequel je reviendrai volontiers me perdre le temps de vos publications. WOW!!! My soul has been blessed by all this beauty and creativity. Love all of it! !